By Jessica Patella, ND abstracted on July 27, 2014 from “Effect of oral magnesium supplementation on physical performance in healthy elderly women involved in a weekly exercise program: a randomized controlled trial” published ahead of print in July of 2014 for the American Journal of Clinical Nutrition. Magnesium plays an important role in the body’s metabolism and muscle relaxation (1,2). Magnesium deficiency can lead to decreased physical performance (3) and increased inflammation in the body (4). The elderly are particularly susceptible because of reduced intake and absorption of magnesium (1). Elderly women are at an even greater risk due to osteoporosis, which limits the exchange of magnesium between the bones and blood (5). For the first time, research has found supplementing with magnesium can improve physical performance in elderly women (1). The research included 139 women with an average age of 71.5 (+/- 5.2) years who were attending a twice-a-week fitness program at the local public gym (1). The women were randomly assigned to be in a control group with no treatment (n=77) or the magnesium group (n=62; 900 mg per day oral magnesium oxide). Phone calls were made to the participants twice a week to record compliance with treatment, any adverse side effects and if they were attending their fitness program (1). 0-12, with a higher score indicating greater physical function (1). After 12 weeks of treatment, the magnesium group showed a significantly greater improvement overall compared to the control group (difference = 0.41 +/- 0.24 points; P=0.03). There was also significant improvement in the magnesium group compared to the control group in walking (difference = 0.34 +/- 0.10 points; P=0.01), chair standing time (difference = -1.31 +/- 0.33 second; P<0.0001) and walking speed (difference = 0.14 +/- 0.03 meters/second; P=0.0006) (1). At baseline, there was no significant difference between the two groups for blood or urinary magnesium levels. After 12 weeks of treatment, there was a significant difference between the two groups for blood levels of magnesium (difference = 0.02 +/- 0.007 mmol/L; P=0.03) and urinary magnesium (difference = 1.45 +/- 0.31 mmol/24 h; P<0.0001), with levels of magnesium significantly higher in the magnesium group (1). No severe adverse side effects were reported. There was 1 case of diarrhea and 2 cases of itching with the magnesium supplementation that stopped as soon as supplementation was stopped (1). 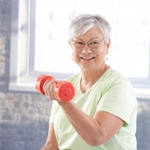 This was the first study to analyze physical performance in elderly people who supplemented with magnesium. The researchers found the results to be clinically important because of the increase in walking speed and the ability to stand from the chair, which is especially important for the elderly in terms of balance and lower limb strength (1). In conclusion, oral supplementation with magnesium for 12 weeks had a significant positive effect on physical performance in elderly women. Researchers suggest supplementing with magnesium for preventing or delaying age-related decline in physical performance, especially in individuals who are magnesium deficient (1). Future research on different dosages should be considered (1). 2. Wolf FI, Cittadini A. Chemistry and biochemistry of magnesium. Mol Aspects Med 2003;24:3–9. 3. Lukaski HC. Magnesium, zinc, and chromium nutriture and physical activity. Am J Clin Nutr 2000;72(suppl):585S–93S. 4. Rock E, et al. Dietary magnesium deficiency in rats enhances free radical production in skeletal muscle. J Nutr 1995;125:1205–10.